Whenever you see a list of information, whether in a report or a task list, you'll notice that there's an Export drop down in the upper-right corner of the page. Export to Excel will export in a text version of your report to excel as an .xls file and we keep some formatting from report when opened in Excel. Export to Excel Unformatted will export in a text version of your report to excel as an .xls file and any formatting will be removed when opened in Excel. Export to Excel Formatted Html will export the report to Excel in HTML format to excel as an .xls file and keep your formatting in Excel. 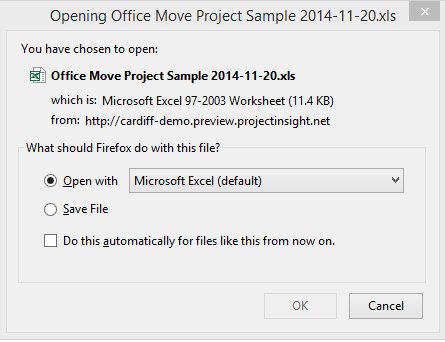 Excel might warn that the file is not a true XLS file and you will be prompted to continue to open it. An export dialog window like the following will appear following your selection. Click Open with to open the file inside your copy of Excel. You can also chose to save the file to open later or for use as an attachment.